This illustrated children's book about Don Pedro is a good farmer who sends his days taking care of his animals, his fields and his beloved vegetable garden. He likes everything to be under control. Little does he know that a tribe of mischievous rabbits is trying to break into his garden. When mysterious events take place, the farmer gets very worried. His world is about to be turned upside down! But Don Pedro will find out that sometimes, change can be a very good thing. Twelve Rabbits and a Turtle is a delightful story of creatures learning to resolve conflict in order to live together in harmony. This fanciful tale introduces children to sustainable gardening. 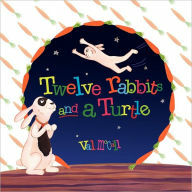 ​Twelve Rabbits and a Turtle is also available in French and in a English/French version that can be used as a language training tool.